Starting off the year at the bottom of the world with two friends was an incredible experience. Antarctica is very remote, and has largely been untouched by man, making it a destination that really can’t be compared to anywhere else. The way most people travel to Antarctica is by taking a cruise from the south of Chile or Argentina. While this is a great way to go because you often see lots of whales along the way, you do have to deal with sailing the Drake Passage, which is one of the roughest waters in the world. According to the stories I heard, virtually everyone gets seasick. We booked the Fly & Cruise option from Antarctica XXI. This was a great compromise because you take a quick flight from Punta Arenas, Chile, to Frei Station Airport on King George Island, and board the ship from there. Our package was six nights, one of which was accounted for in Punta Arenas. This was definitely one of the coolest flights I’ve even been on. Antarctica Airways. The flight itself is only about 90 minutes, and while it has a scheduled departure time, you can’t actually take off until Frei Station confirms that the weather conditions are safe for landing. This is done because there are no alternate landing sites to divert to. To play it extra safe, the aircraft is loaded with enough fuel to make the trip back, in case things drastically change while you are en route. Departure board at Punta Arenas Airport. There's our flight ... DAP 492 to Antarctica! As a result, you can expect to wait any number of hours in Punta Arenas airport. We were very lucky and only had to sit around for about two hours. There was a group from the day before whose flight was canceled, and they had to return the next day to try again. Make sure your iPad is loaded up with plenty of movies. About a half hour before you start descending for Frei Station, the Captain makes an announcement to let you know that if you want to use the washroom, you’d better do it now because there are no facilities at the airport. There are no washrooms because Frei Station doesn’t have a terminal building. As you begin descending, you get a good feeling for the desolation. There is nothing as far as the eye can see. No vegetation. No signs of life. Just snow, ice, and rock. I had never landed on a gravel runway before. It was an interesting feeling. You sort of bounce up and down until you’re fully on the runway. 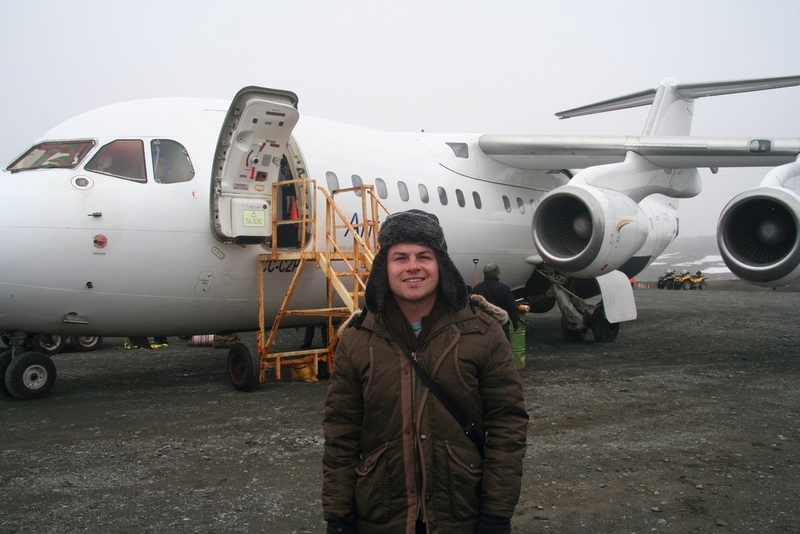 After taxiing, they roll up a metal staircase, you deplane, and start a very long walk down the runway you just landed on towards the town of Villa Las Estrellas - the only civilian inhabited place in Antarctica. Population: 47. Even in Villa Las Estrellas there’s nothing. It’s all for the locals. It looked like there was a post office, bank, and medical facility. I overheard a comment that there’s one person that runs the post office and bank, and he alternates the operating hours of each. They do however have cell service, so you can post your “I’m in Antarctica” Facebook status update. Don’t expect a Caribbean cruise line with casinos and movie theaters. These cruise ships are typically old ice breakers that have been repurposed for tourists. Our ship was fairly small (less than 100 passengers and crew) and had very limited facilities which consisted of a couple of lounges and a dining room. The cabins were basic, but decent. The beds were reasonably comfortable. Communicating with the rest of the world is also limited. There was an option to buy minutes on the ship’s satellite phone or satellite Internet connection. Both were very expensive. I bought an Internet package which was alright to check basic emails, but sending a photo attachment home to my family and friends was painful. What they don’t prepare you for is how awful the food is. Considering the cost of this adventure, I assumed we’d be dining on meals prepared with exquisite ingredients. In reality, it was all reheated frozen food. This is primarily because the ships are in such remote locations that it’s very difficult to resupply them. I was really happy that I had brought along some chocolate and other snacks. Antarctica cruise ship "Ocean Nova"
There are two types of excursions you make in Antarctica. Pontoon transfers to land, or pontoon trips near the ship. We typically had one excursion in the morning, and one in the afternoon. 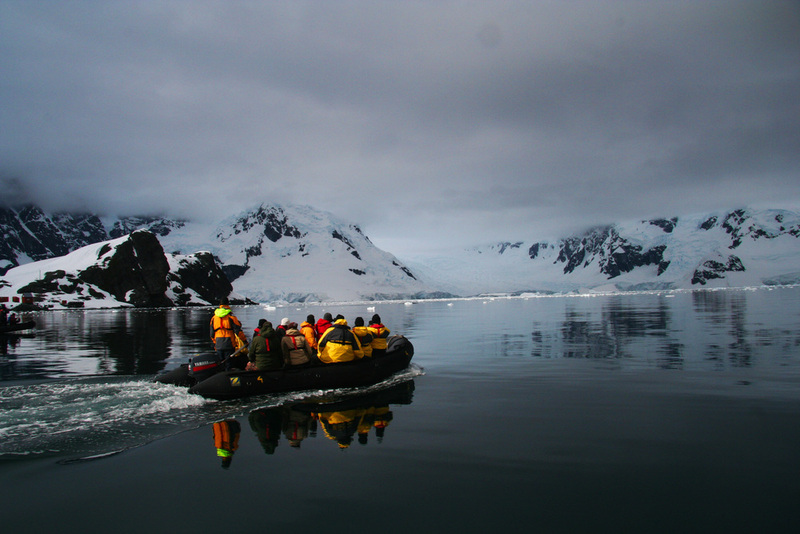 Most of the land excursions involve exploring abandoned scientific research stations, and most of the pontoon trips involve navigating icebergs and whale or seal watching. Although I packed winter boots, as I was told to by the tour operator, they were totally useless because in order to leave the ship you have to wear the galoshes they provide. Each time you enter or exit the ship you dip them into an antibacterial solution. This helps prevent the spread of germs that could contaminate either Antarctica or the ship. There’s a lot of snow everywhere, so it’s decent exercise walking around. A couple of the places we stopped even included hiking up snow-covered mountains. Two pontoon trips were particularly interesting. One included watching a whale breach. Truly incredible to see this live and up close. Another one of the interesting aspects to this trip was that there was no night the entire time. It basically got as dark as dusk for a few hours, then the sun came up again. New Year’s Eve was no different. It didn’t really get too dark, and the passengers and crew rang in the New Year with some music, booze, and food. 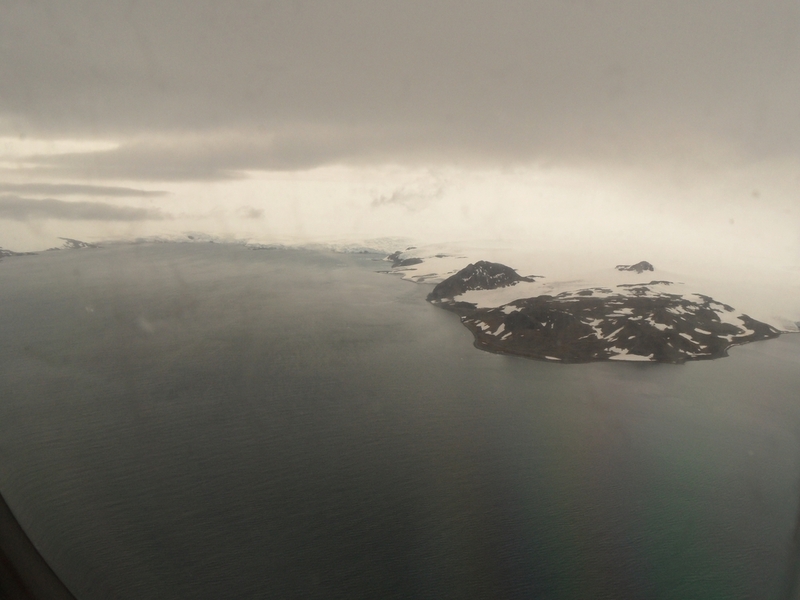 We were very lucky because on New Year’s Day, we actually made landfall in Antarctica. All of the other stops on the cruise (and in fact, as I understand, most of the stops on most “Antarctic” cruises) were islands near Antarctica, but not the actual continent itself. It felt like a special start to the year, to be experiencing setting foot on a continent that so few have been to. The weather was gorgeous .. sunny and +14C (57F) .. not bad for Antarctica! We hiked up a mountain and saw this incredible view. I love penguins! And definitely got my fill of them on this trip. The only wildlife you really encounter are seals, whales, birds… and penguins. There are literally thousands of them everywhere. They don’t often encounter people, so we aren’t seen as predators, and they aren’t really afraid to get close. It’s very easy to be within 2-3 feet of several penguins. Port Lockroy is a British research base and museum, and home to the southernmost store and post office in the world! It’s a popular stop on many Antarctic cruises. You can wander around, see penguins and cormorants, send a postcard home, and purchase a few souvenirs. Credit cards accepted! You don’t need winter boots. You do need some kind of delicious snacks. Whether you choose to fly or sail to King George Island, you will still need to find a way to deal with rough seas. A fellow passenger gave me a wristband with a plastic button that stimulated natural relief from the nausea I experienced on one of the days. This was incredible, and I’ll never set foot on another ship without something like this. You can buy them at REI, or www.psibands.com. You will appreciate having brought sunglasses, a warm hat and earmuffs. Layering is important, but I was fine with shell pants from REI, which I wore over track pants. My winter coat from Toronto was enough to wear on top of a regular t-shirt. Keep in mind that you are getting dressed and undressed at least twice a day to prepare for leaving the ship, so the more layers you have to deal with, the more annoying it will be.